Jose Mourinho’s position at Manchester United has never been so perilously poised before. The manager may even be a single defeat away from the sack, as reported by The Sun. With one of the biggest management jobs in world football potentially about to be up for grabs, there’ll be plenty of impressive coaches around Europe with half an eye currently on the goings on at Old Trafford. That being said, there is one name who has already been touted as the Red Devils’ preferred candidate for the role: Zinedine Zidane. The iconic Frenchman has been out of work since dramatically calling an end to his time in charge of Real Madrid just days after securing the La Liga giants’ third successive Champions League crown under his guidance. With this back-to-back Champions League hat-trick under his belt, Zidane’s credentials could possibly be considered beyond doubt. Many certainly believe the former midfielder has nothing left to prove. Yet, for others, big question marks remain over Zidane’s suitability for the United job. The key criticisms of Zidane as a manager are that he lacks experience – he has only three seasons of elite level management behind him – and that he has never had to build a team himself. 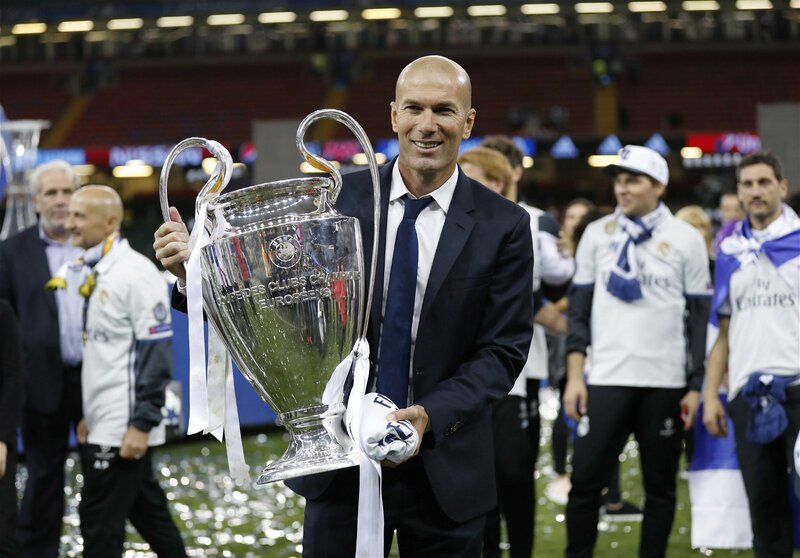 Undeniably, Zidane took over a squad stocked with world class stars at the Bernabeu and then duly delivered what may have simply been expected of such a high quality collection of players. However, there are aspects of Zidane’s character and his previous achievements that make him an ideal target for United’s current situation. What the 46-year-old excelled at in Madrid was not improving his side via the transfer market but rather ensuring that he got the best out of those already at his disposal. Whilst he never had to worry unduly over a lack of quality in his ranks, getting the likes of Cristiano Ronaldo, Gareth Bale, Luka Modric, Toni Kroos and Sergio Ramos to all work together so effectively is an impressive feat in and of itself. Balancing those egos within a tactical system and a structure that relied upon squad rotation required a deft managerial touch. Zidane is armed with the requisite skills for such a task thanks in part to his own glittering career in the game and status as one of all time greats. Zidane’s reputation commands respect from all involved in the sport and allowed him to maintain authority over the array of superstars in his squad. To a slightly lesser extent, United’s is also a squad full of globally renowned stars. Paul Pogba, David de Gea and Alexis Sanchez are all hugely respected players. The Premier League side need a manager able to exert his authority over these individuals and motivate them to work hard for the collective good of the team in a cohesive manner. Zidane’s CV suggests that he fits that bill. The other objection raised to Zidane’s appointment is the consensus that he has never had to build a team. That is true to an extent. In his last game at Real Madrid – the Champions League final – of his starting XI, none were signed by Zidane himself. However, to suggest that starting XI reflected the team he took overtire years before would be unfair. The tactical masterstroke of building Real’s midfield unit around Casemiro – a bit part player before – belongs to the Zidane era. Equally, the Frenchman can also claim plenty of credit for Raphael Varane’s stunning development into a world class centre-back. Zidane’s lack of experience with constructing teams via the transfer market is only especially relevant if it is accepted that that is what is required at Old Trafford. Undoubtedly, United’s squad needs some work. It must be of a higher priority, though, to first begin getting the best out of the players already in situ in the north west. If Zidane could do for the likes of Anthony Martial and Marcus Rahsford what he did for those aforementioned players in Spain, then many of United’s problems would immediately be solved without a penny spent. Martial and Rashford do not lack talent, but rather are being deprived of the guidance and coaching that Casemiro and Varane received. Zidane’s appointment, and the requisite coaching staff alterations that it would bring, could go along way towards rectifying this situation and seeing the Red Devils’ most promising young stars begin to shine. United are crying out for something new. They need an inspirational leader who can take them back to the very top of the game. Zidane may not be the long-term answer. He is, though, certainly the antidote to Mourinho. Zidane’s arrival would restore optimism and confidence to the Theatre of Dreams, and that in itself could do wonders for the club’s currently ailing fortunes.